wildlife bird art sculpture 10 × 5 in. Beautiful mother swan leads her cygnet baby birds past a water lilly. 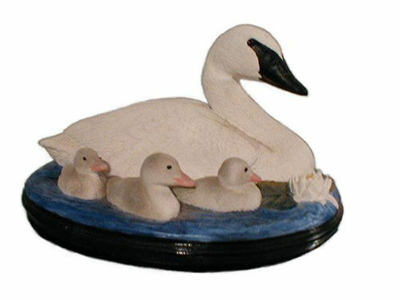 A classic heirloom waterfowl bird edition for your home decor or gift. This swan is the largest swan and north American waterfowl specie (28 pounds, 60-72 inches and 8 -foot wingspan). The trumpeter swan was close to extinction In 1932, fewer than 70 trumpeters were known to exist worldwide. They have increased in numbers due to conservation and habitat efforts. With healthy populations in Alaska, Canada, and the Midwest. The male (called a cob) and the female (called a pen) swans establish lifelong mates at about 3 years of age. The trumpeter swan lays a clutch of 3 to 9 eggs averaging 35 days incubation. The downy gray baby birds are called "cygnets". The same nest site may be used for several years. Tubers, stems, leaves, and seeds of aquatic plants make up the diet of 10+ week old cygnets and adults.